1. Soak 8 wooden skewers in cold water for 30 minutes. Place the chunks of pork, onion and pepper in the marinade bag from the pack of Mediterranean rub. Sprinkle over the rub, add 1 tbsp oil and the garlic, then season. Shake the bag to coat everything, then marinate in the fridge for 30 minutes, or up to 3-4 hours. Discard the marinade and bag after removing the meat for cooking. 2. Preheat the oven to 200˚C, gas mark 6. Thread the meat onto the skewers, interweaving with the onion and pepper. Cook on a hot griddle pan or barbecue for 10-12 minutes, turning every 2-3 minutes, until charred all over, then transfer to a foil-lined oven tray and roast for another 10-15 minutes, ensuring the pork is cooked thoroughly until there is no pink meat and the juices run clear. 3. Meanwhile, toss the tomatoes, cucumber, beetroot, lettuce, salad onions, lemon juice and remaining 1 tbsp oil in a large bowl. Season, then scatter with the feta. 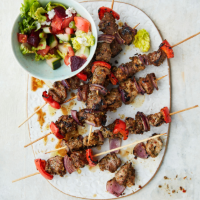 Serve the souvlaki and salad with flatbread, if liked. If you don’t have time to make the feta salad, pick up a pack of ready-prepared Waitrose Greek side salad. This recipe was first published in Thu Apr 26 12:38:25 BST 2018.